In the previous chapter we looked at the design patterns that we will need to learn and use regularly in the course of developing iPhone applications. In this chapter we will work through a detailed example that will demonstrate the View-Controller relationship (we will introduce the Model part of the MVC equation in the next chapter) together with the implementation of Target-Action pattern to create an example interactive iPhone application. The purpose of the application we are going to create is to perform unit conversions from Fahrenheit to Centigrade. Obviously the first step is to create a new Xcode project to contain our application. Start Xcode and on the Welcome screen select Create a new Xcode project. On the New Project screen choose the Application option located under iPhone OS in the left hand panel, select View-based Application and click Choose…. In the drop down file selection pane name the project UnitConverter and choose a suitable folder to hold the project files before clicking the Save button to proceed to the main Xcode project window. As outlined in previous chapters, Xcode has created a number of files for us to use in developing our application. Some of the windows in the above figure may not be displayed by default. To display the View window double click on the View icon in the UnitConverterViewController.xib window. To display the Library window select Tools -> Library and to display the View Attributes window select Tools -> Attributes Inspector. Within the Attribute Inspector window, type the words Enter temperature into the Placeholder text field. This text will then appear in a light gray color in the text field as a visual cue to the user. The last user interface object we need to add is a label where the result of the conversion will be displayed. Add this by dragging a Label object from the Library window to the View and position it beneath the button. Stretch the width of the label so that it is approximately a third of the overall width of the view and reposition it using the blue guidelines to ensure it is centered in relation to the button. <google>IOSBOX</google> Double click on the label to highlight the text and press the backspace key to clear the text (we will set the text from within a method of our View Controller class when the conversion calculation has been performed). Though the label is now no longer visible it is still present in the view. If you click where it is located it will be highlighted with the resize dots. At this point the user interface design phase of our project is complete and the view should appear as illustrated in the following figure. We now are ready to try out a test build and run. Before we move on to writing the controller code for our application and then connecting it to the user interface we have designed we should first perform a test build and run of the application so far. From within Interface Builder select the File -> Save menu option and then exit from the builder via the Interface Builder -> Quit Interface Builder option. Back in the Xcode project window click on the Build and Run button located in the toolbar to compile the application and run it in the simulator. If you are not happy with the way your interface looks feel free to reload it into Interface Builder and make improvements. Assuming the user interface appears to your satisfaction in the simulator we are ready to start writing some Objective-C code to add some logic to our controller. Exit from the simulator before proceeding to the next step by selecting the iPhone Simulator -> Quit iPhone Simulator menu option. 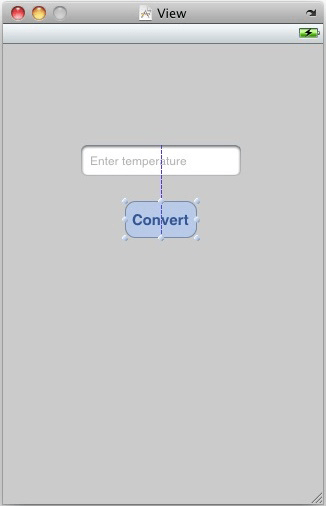 When the user enters a temperature value into the text field and touches the convert button we need to trigger an action that will perform a calculation to convert the temperature. The result of that calculation will then be presented to the user on the label object. The Action will be in the form of a method that we will declare and implement in our View Controller class. Access to the text field and label objects from the view controller method will be implemented through the use of Outlets. Before we begin, now is a good time to highlight an example of the use of subclassing as previously described in An Overview of the iPhone Application Development Architecture. The UIKit framework contains a class called UIViewController that provides the basic foundation for adding view controllers to an application. In order to create a functional application, however, we inevitably need to add functionality specific to our application to this generic view controller class. This is achieved by subclassing the UIViewController class and extending it with the additional functionality we need. When we created our new project, Xcode anticipated our needs and automatically created a subclass of UIViewController and named it UnitConverterViewController (using as a prefix the name that we gave to our new project). In so doing, Xcode also created two source files; a header file named UnitConverterViewController.h and a source code file named UnitConverterViewController.m. //  Created by Techotopia on 3/30/10. //  Copyright __MyCompanyName__ 2010. All rights reserved. As we can see from the above code, a new class called UnitConverterViewController has been created that is a subclass of the UIViewController class belonging to the UIKit framework. Before we proceed it is probably a good idea to pause and explain what is happening in the above code. Those already familiar with Objective-C, however, may skip the next few paragraphs. In this file we are implementing the convertTemp method that we declared in the .h file. This method takes as a single argument a reference to the sender. The sender is the object that triggered the called the method (in this case our button object). Whilst we won’t be using this object in the current example, this can be used to create a general purpose method in which the behavior of the method changes depending on how it was called. We could, for example, create two buttons labeled Convert to Fahrenheit and Convert to Celsius respectively, each of which calls the same convertTemp method. The method would then access the sender object to identify which button triggered the event and perform the corresponding type of unit conversion. Next, the code declares a variable of type double in order to handle the fact that the user may have entered a floating point value. We then use dot notation to access the text property (which holds the text displayed in the text field) of the UITextField object. This property is itself an object of type NSString. The NSString object has a method, named doubleValue that converts the string value to a double. We therefore call this method on the text property and assign the result to our farenheit variable. 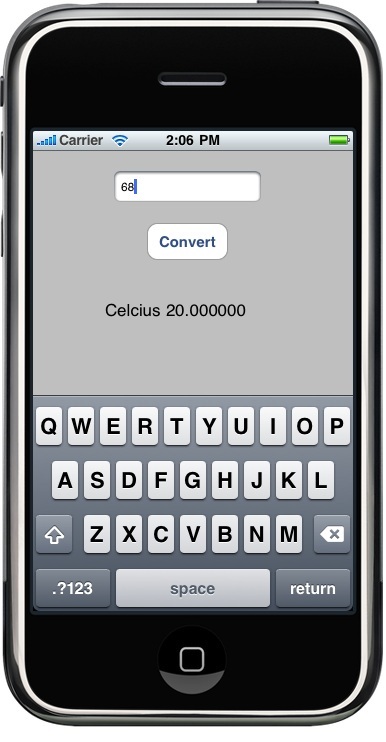 Having extracted the text entered by the user and converted it to a number we then perform the conversion to Celsius and store the result in another variable named celsius. Next, we create a new NSString object and initialize it with text that comprise the word Celsius and the result of our conversion. In so doing, declare a pointer to this new object and call it resultText. Finally, we use dot notation to assign the new string to the text property of our UILabel object so that it is displayed the user. The last step releases the memory that was allocated to the object referenced by resultText since it is no longer needed. Before proceeding to the next section of this chapter, now is a good time to perform a build and run to make sure that no errors exist in the code. Click on the Build and Run button in the toolbar and correct any syntax errors that are reported. The final step in developing our application is to connect the actions and outlets we have declared in the view controller class to the actual objects in the user interface view. Fortunately, this can all be done visually from within the Interface Builder tool. Releasing the mouse button over the File’s Owner icon will display a menu with a list of methods available in the view controller class. In our case the only method is convertTemp so select that method to initiate the connection. The event listing in the Connections dialog will subsequently update to reflect the new connection. Save the changes that you have made (File -> Save) and then exit from Interface Builder (Interface Builder -> Quit Interface Builder). In this chapter we have put into practice some of the theory covered in previous chapters, in particular the separation of the view from the controller, the use of subclassing and the implementation of the Target-Action pattern through the use of actions and outlets.